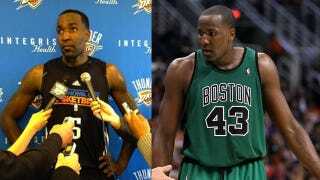 So what if Perk was miserable about getting traded to OKC? So what if his team got bounced from the playoffs while he played a minor role? So what if he got arrested for drunk and disorderly conduct in August? None of that matters, because he's svelte, damn it! Perk lost 31 pounds during the offseason. He'll be trying out Thom Browne suits with Serge Ibaka in no time.